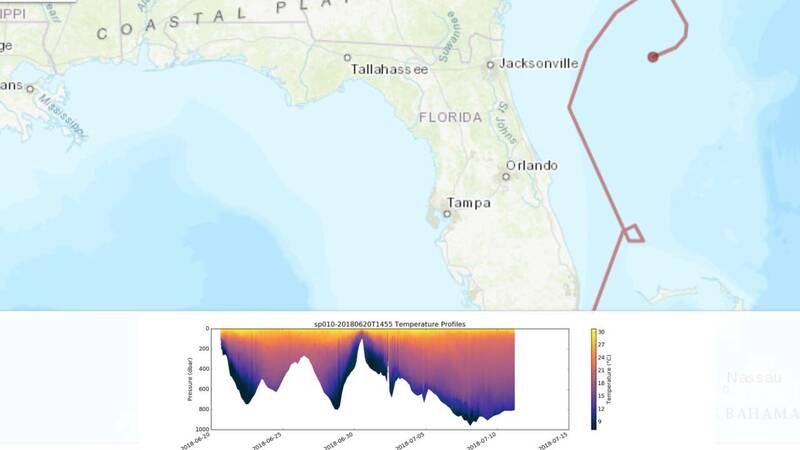 JACKSONVILLE, Fla. - Conditions under the sea make a big impact on the ways hurricanes strengthen or weaken and soon a fleet of 15 unmanned torpedo-shaped gliders will be deployed ahead of storms to collect useful oceanic data for forecasters. “If you want to improve prediction of how hurricanes gain strength or weaken as they travel over the ocean, it's critical to take the ocean’s temperature and measure how salty it is,” said Gustavo Goni, an oceanographer at NOAA’s Atlantic Oceanographic and Meteorological Laboratory who is helping lead the glider research. Deeper layers of ocean waters may be saltier and sometimes freshwater can form a barrier to cold water below stopping it from reaching the surface. These situations often intensify storms when warm water gets confined in the top ocean layers. Now just as the hurricane season picks up across the Caribbean Sea and tropical Atlantic Ocean, NOAA, it's university partners and the U.S. Integrated Ocean Observing System will begin deploying remotely-operated, battery-powered gliders from vessels off Puerto Rico and the U.S. Virgin Islands in mid-July. The gliders dive from the surface to a half mile of depth and then regularly resurface several times a day to transmit collected data to satellites. One glider is currently off the coast of Jacksonville in the Gulf stream collecting salinity and temperature. A plot of under water temperature can be followed along with the glider track. You can see the glider location and data it is collecting through the U.S. IOOS Glider Data Assembly Center later this summer.